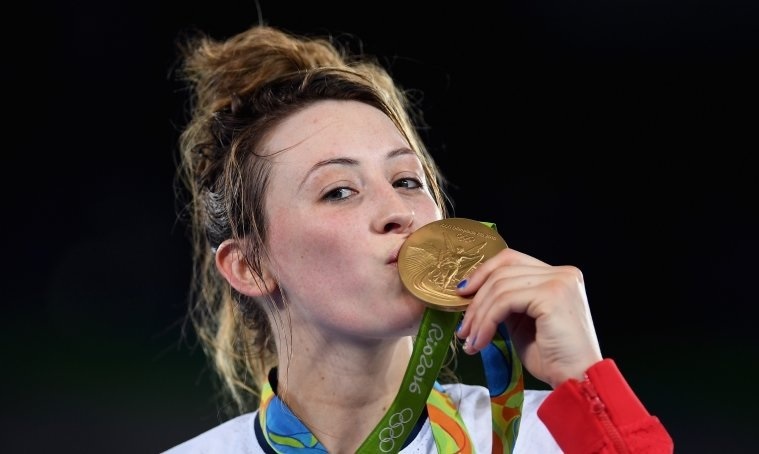 Jade Jones retained her Olympic title in stunning fashion in Rio this morning and took coach Paul Green onto the mat to help celebrate her brilliant win over Spanish rival, Eva Calvo Gomez. 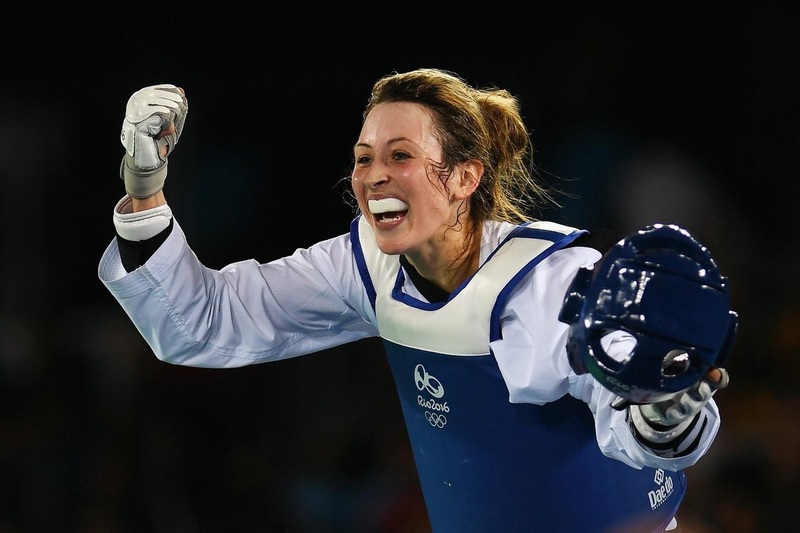 The London 2012 champion defeated her former nemesis 16-7, living upto her ‘Headhunter’ nickname in the final round with a brace of decisive and vital head shots. Welsh wonder Jones’ victory in the Carioca 3 Arena took Team GB’s gold medal tally to 22. The 23-year-old Manchester based star resisted the temptation to throw her protective helmet into the air as she did four years ago. But within seconds of the dramatic -57kg final ending, Jones led Mancunian Green, himself a former Olympian, onto the mat to join in the crowd celebrations. “I am still only 23 and to be double Olympic champion is crazy,” said an ecstatic defending champion. “I just can’t believe it. “But I didn’t realise how much pressure I was going to be under. “Before competitions I have been crying in sessions and you can’t see it happening because you are so stressed. But I did it when it mattered so I am buzzing. “And it’s all down to him,” she smiled pointing at her coach. Calvo Gomez started the final with a winning 5-3 head-to-head record though Jones had won the last two meetings including a 14-4 success at the World Grand Prix in Manchester last October. Everyone of Calvo Gomez’s three previous Rio bouts were decided by a single point while Jones sailed through largely untroubled. And two, three points shots in less than 10 seconds in the opening round put Jones in command. The Spaniard’s coach appealed unsuccessfully to have one of the hits erased but lost the video review decision. Calvo Gomez, the former world number one, showed her mettle to hit back in the second round to cut her deficit to a single point going into the final two minutes. The highlight for her was a three-point head hit with Jones’ only point coming from a penalty. It threatened to be a nervy last round. Instead, Jones re-discovered the range she had in the first round and dominated all the way to the end. “It was a mental thing to start with against her (Calvo Gomez). But having a rivalry is good because it keeps you hungry and training hard. 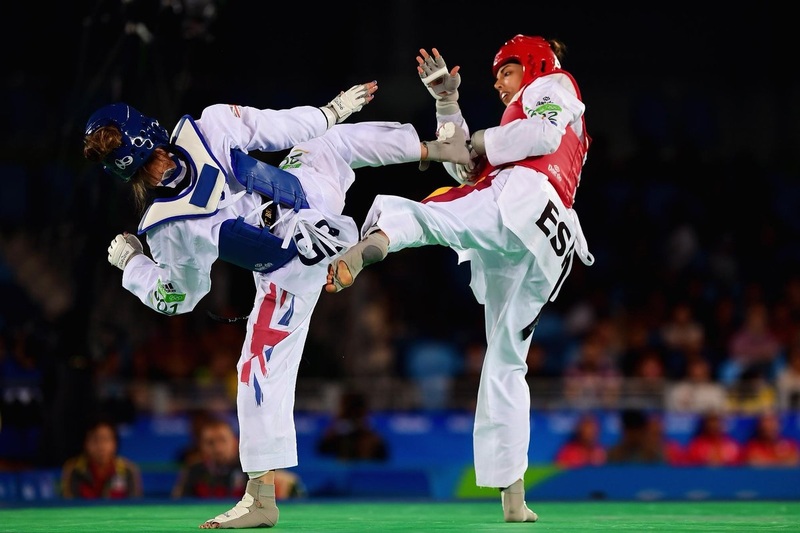 Jones defeated another familiar opponent to reach her second successive Olympic final in Sweden’s Nikita Glasnovic. The pair had contested the European final in Montreux back in May when Jones emerged an 11-5 winner. The only drama of note came when Glasnovic caught Jones with a head shot to close from 4-1 down to trail only 4-3. After that minor scare the title holder recovered her composure to run out a 9-4 winner. It had been plain sailing also earlier in the tournament including an opening 12-4 win over Moroccan Naima Bakhal. Jones set out her stall by notching a point within the first 10 seconds. Next up was Belgium’s Raheleh Asemani, a former Iranian fighter with an intriguing back story. Originally among the candidates considered by the International Olympic Committee for a team of refugee athletes, Asemani gained Belgian citizenship on April 13. Jones knew she was in for a testing quarter-final but remained focused superbly to complete a 7-2 win. The rest is history! “I know inside I’m the best but you can still lose so it’s such a scary feeling. You’ve trained for four years of your life, six hours a day, and when it pays off it just feels amazing.